1. Wash the radishes and then cut them into small pieces and cut the leaves as well. 2. Take them in a cooker along with some salt and water and boil them. Give 2-3 whistle. 3. Dry off the excess water from it in cooker and then mash it nicely.If the radish is little too sour then just take out and dry excess water in hand. 4. Take oil in pan and add cumin seeds and garlic and let splutter. Add onions to it and fry it nicely. 5. Add radish mixture to it and add red chilly powder and salt if less to it and fry it nicely till done. 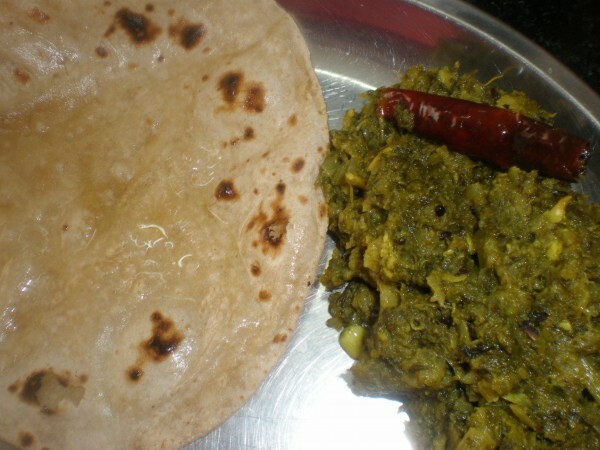 One can add equal amount of spinach(palak) and pressure cook it. One can add tomotoes, ginger garlic paste, etc when one pressure cook it and no need to add more water and add according to how much palak leaves. Cook it while till it leaves water before pressure cooking and rest method is same. For palak one can add whole red chilly in oil for tadka instead of red chilly powder.